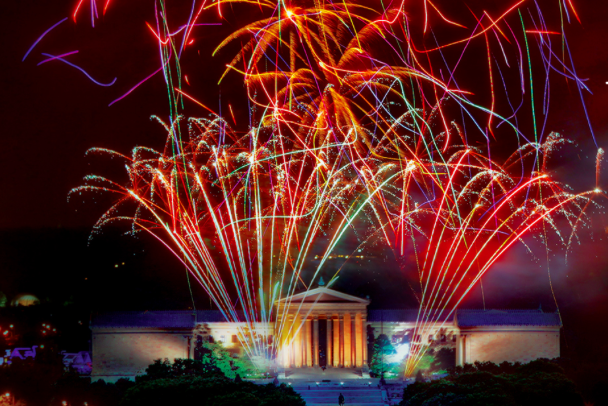 Fireworks above the Philadelphia Museum of Art on Independence Day. This year's Wawa Welcome America festival already began this past Thursday with a slew of free events — but things are only getting crazier from here. The multi-day festival concludes on July 4 with a large takeover of Center City, complete with a parade, a shutdown of the Benjamin Franklin Parkway, fireworks and a concert. Starting July 3, there will be some pretty massive road closures and changes to our regular transportation schedules, so be prepared. Here's how to avoid, or celebrate, the festivities. For a full list of events, you can visit Wawa Welcome America's calendar. There are free museum days, movie screenings, happy hours and more. On July 4, things kick off at City Hall, with the Celebration of Freedom at 10 a.m. A parade will commence at 11 a.m. There are also a slew of historical lectures and tours at the Independence Visitor Center in Old City. Here's a full schedule. Want to watch some fireworks? We've already put together a list of fireworks in Philly, New Jersey and the suburbs. The road closures are going to be extensive around the Parkway and Art Museum area. It begins on Tuesday, July 3 at 7 a.m. and will be implemented in phases until the end of the day July 4. To get you started: The inner lanes of the Parkway on Tuesday at 7 a.m. They will reopen at 3 p.m. for rush hour traffic and then close again at 7 p.m. These lanes will remain closed until the morning of Thursday, July 5. For the rest of these instructions, and a comprehensive look at the road closures, here's a useful map. For Old City closures, here's another map.These all begin at noon on July 4. On July 4, all buses, trolleys, the Broad Street and Market Frankford lines and Regional Rail trains will operate on a Sunday schedule, with special late night Regional Rail service following the fireworks on the Parkway. If you want to watch the fireworks on either the Delaware River Waterfront or the Parkway, you can still catch a late-night train. Here's a full late-night schedule of Regional Rail trains. Customers are encouraged to check SEPTA's System Status routinely to make sure everything is on time and running smoothly. The BSL and MFL lines will be up and running, but a few bus routes — 7, 32, 33, 38, 43, and 48 — will be detoured. Here are more details. An excessive heat warning has been issued by the National Weather Service this week, with temperatures expected to reach 107 on Sunday and Monday. On July 4, temperatures are also expected to exceed 100 degrees. If you're attending the Party on the Parkway, there will be restrooms, ATMs, medic units, jumbo trons and tents intended to be meetup spots for separated families. Here's a map of where to find them. Here are some tips from the city to be prepared — and stay cool — during large events.